Like being taken outside and beaten up by a gang of enraged skinheads, Aces of the Galaxy is an outright assault on your senses of the most unwelcome variety. Like Space Harrier, Panzer Dragoon or most recently, Rez, Aces is an on-rails arcade shooter, accelerated to a speed which makes every stage a dizzying blur of enemies and lasers. From Starfox it lifts the roll-to-evade mechanic and end credits where you get to shoot down the staffer’s names, from Panzer Dragoon it lifts the multi lock-on missiles, and from Afterburner it takes its frantic pace, but it misses the tight pacing and wits of all three. By making the most of exciting set-pieces and interesting enemy waves, even slower shooters like Rez can stand among the best games on Live Arcade. 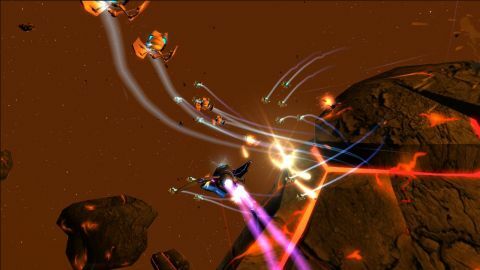 Aces of the Galaxy tosses enemies around like confetti and makes every stage a five-minute mindless bad guy blitzkrieg. Other on-rails shooters are a lesson in design Aces of the Galaxy must have skipped. Description This on-rail shooter makes an assault on your senses; poor pacing, frantic action and tons of enemies.